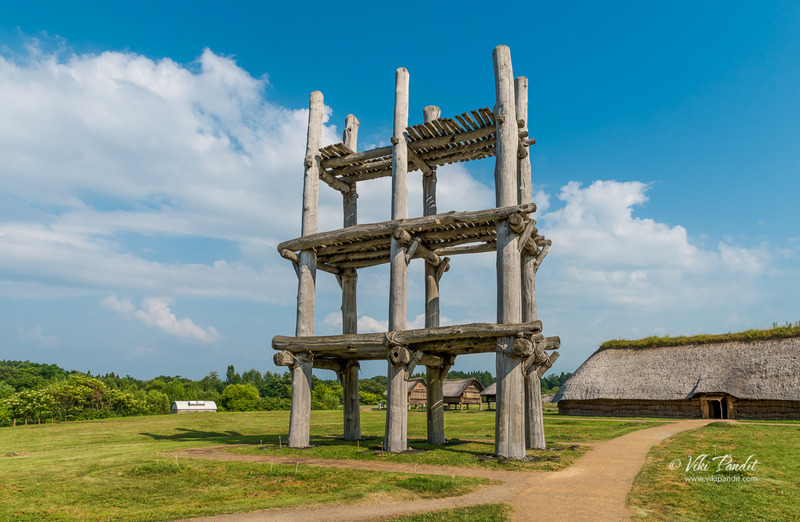 Today we visit the ruins of Sannai Maruyama in Aomori. Discovered in 1992, the Sannai Maruyama Archaeological Site (三内丸山遺跡) is the largest and one of the most complete and best preserved Jomon Period (13000-300 BC) villages in Japan. We were thoroughly refreshed from our previous day at Jōdogahama beach in Iwate. 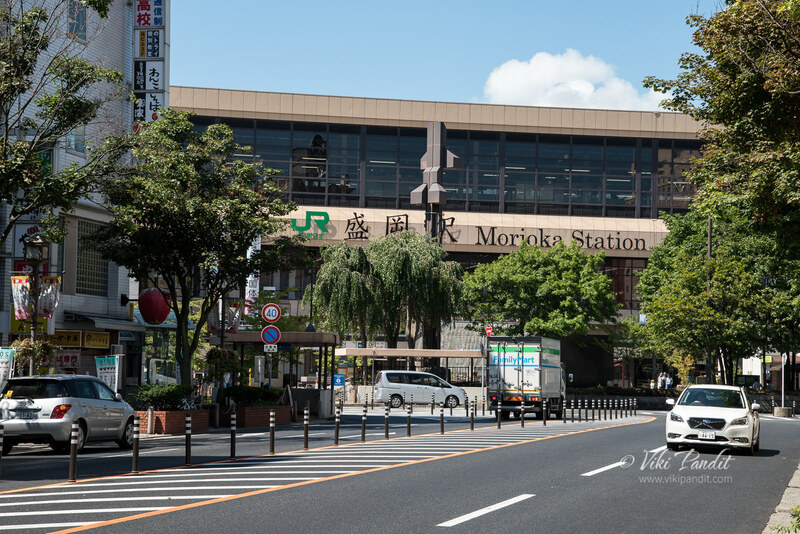 The day was bright and sunny as we walked to Morioka Station to catch the train to Aomori. 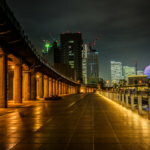 As we entered the JR station, it was still decorated, in view of the just passed Tanabata celebrations. Tanabata originated from a romantic legend about two lovers that are only able to meet each other once a year. 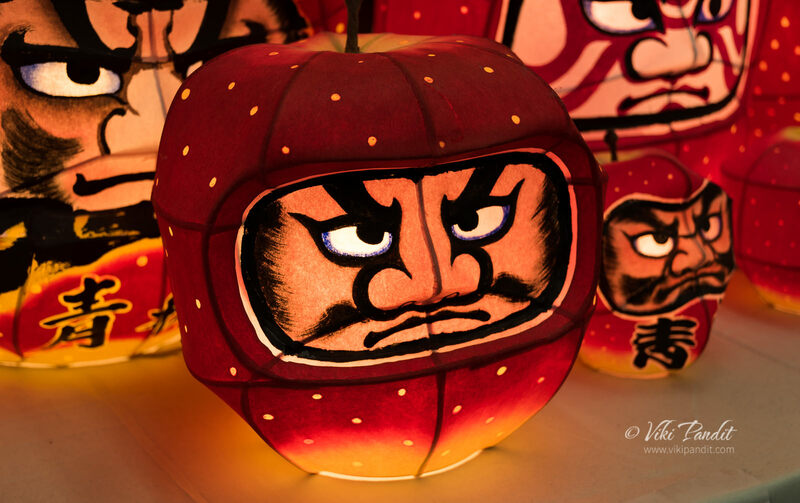 This festival is held across Japan on July 7 or August 7 depending on the region. 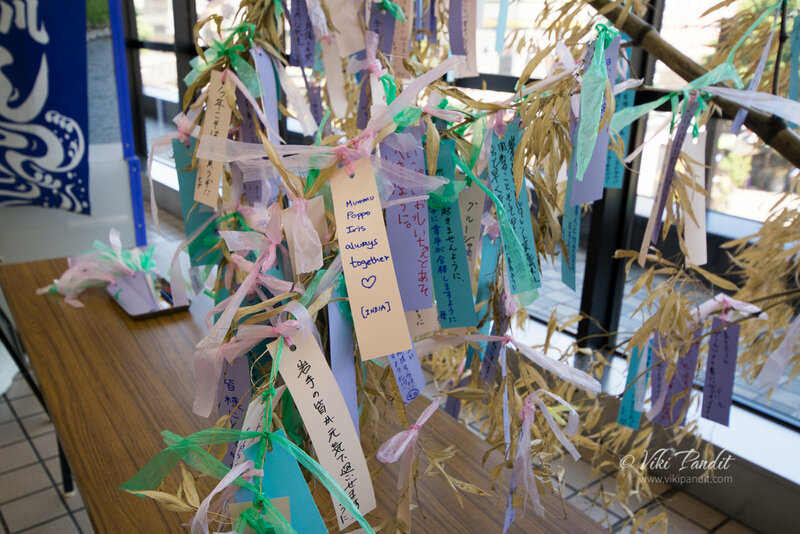 It’s said that your wishes will come true if you write them down on strips of paper called the tanzaku and hang them on bamboo branches. We left a tanzaku wish note praying for a happy future at one of the booths. 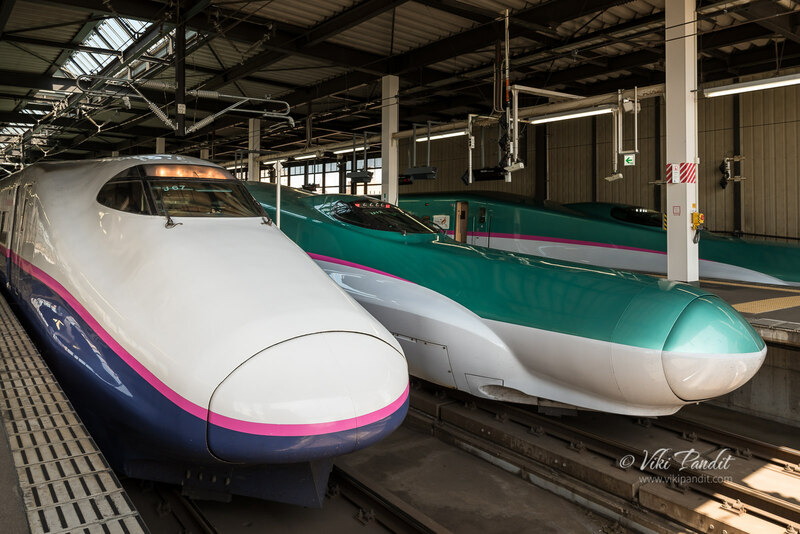 The Shinkansen takes only an hour for the journey from Morioka to Aomori, however Mani didn’t posses a JR Pass and in order to save some money, we used the limited express train. It was a long 3 hour journey but felt rather shortened by the animated chats between us. We reached Shin Aomori at 11 am. 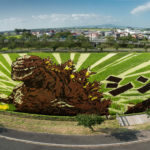 The Nebuta festival had just got over in Aomori the previous day and the station was adorned with many nebuta floats at certain places. 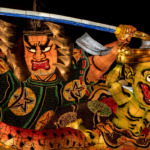 The Nebuta festival is one of the most popular festivals in Aomori and if you miss it you can always drop down to the Nebuta Museum to witness the amazing floats. It was almost mid-day and the sun was burning bright, and although Aomori was cooler than Iwate, the strong Sun made it uncomfortable. We left our luggage at the Station lockers and waited for the bus to Sannai Maruyama. The sightseeing bus called Shuttle de Route Bus Nebutan-go arrived in a few minutes. 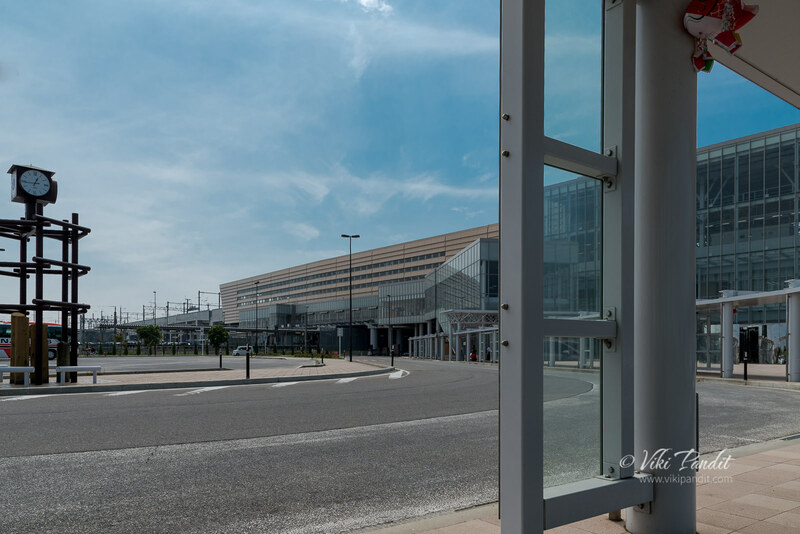 The bus route keeps running in a loop all day, and to reach the Sannai-Maruyama site one has to get down at the Sannai-Maruyama-Iseki-mae bus stop. The ride cost us 310 Yen each. Once we had all the information, we decided to first take our lunch and then proceed to investigate the huge site. 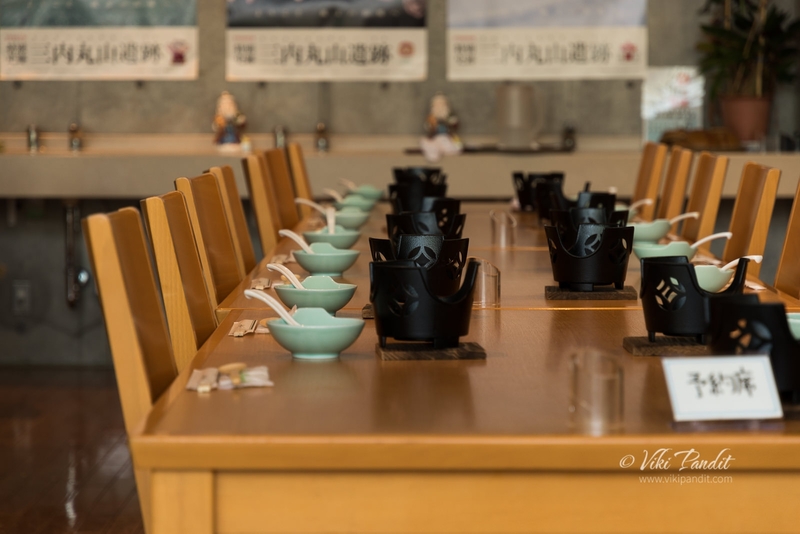 The Gosennen-no Hoshi restaurant inside the campus serves delicious meals using prominent Jomon ingredients. 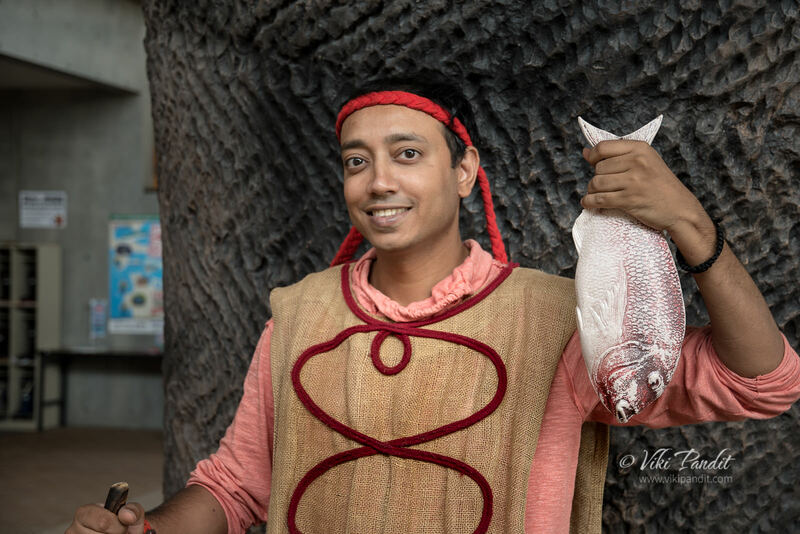 One can find a variety of set menus made of fish, vegetables and nuts that people during the Jomon period used to consume. It might feel different from the regular meals but I decided to give it a try anyway. 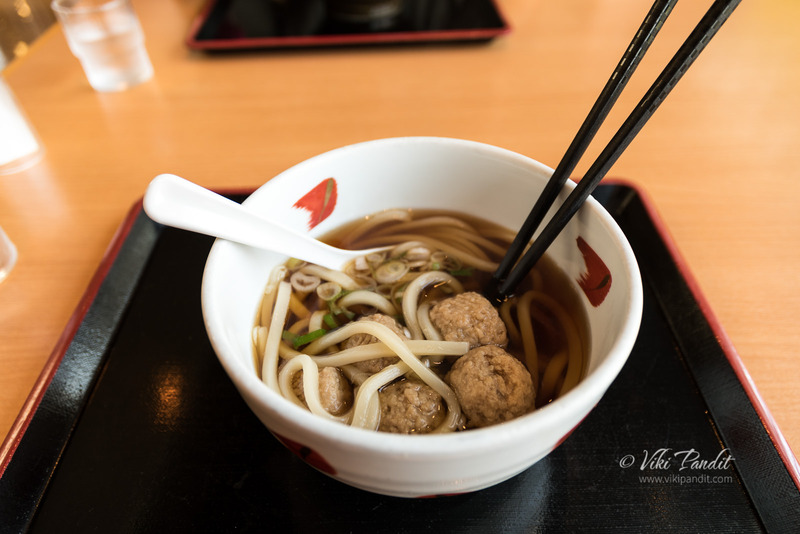 I ordered the “Shiokatsukune Udon.” It was basically soft “Chicken meatballs” with bonitos(fish) and kelp soup. After an enjoyable meal of meatballs at the Gosennen-no Hoshi restaurant, we walked down to the Sanmaru Museum. 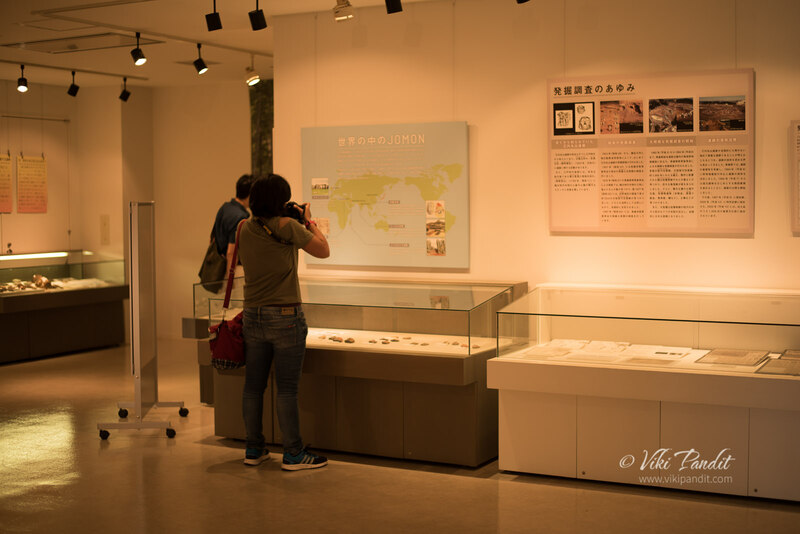 The Sanmaru museum exhibits objects excavated from the excavation site and explains about the people who lived during the Jomon Period. 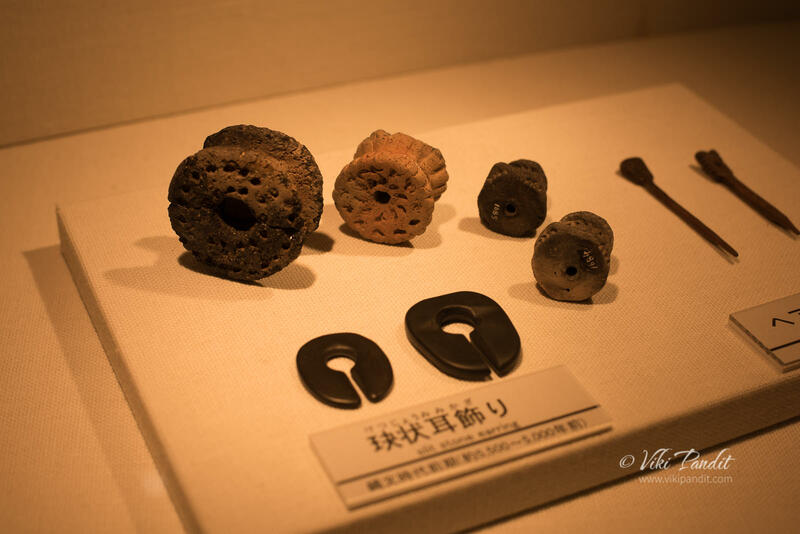 The Jomon period encompasses a large expanse of time, constituting Japan’s Neolithic period and the museum exhibits approximately 1,700 artifacts excavated from the Sannai-Maruyama site. 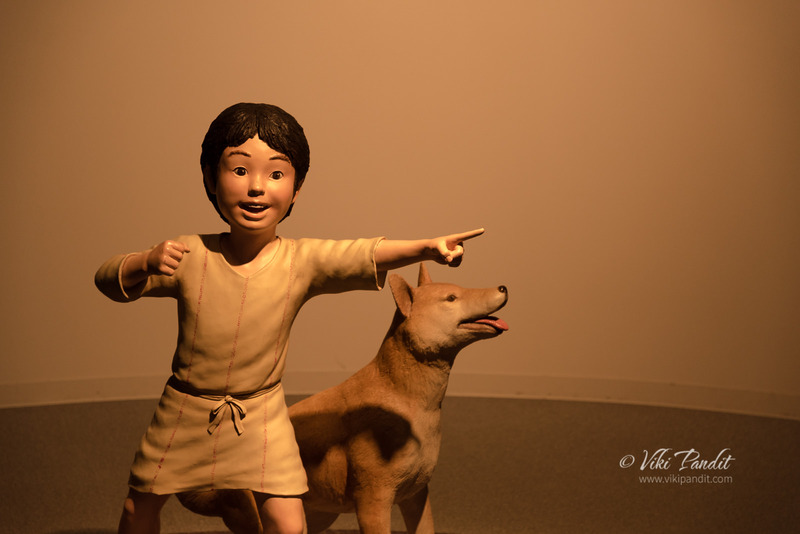 A dimly lit path led us towards a life-sized figure of a young boy with his Inu(dog) who pointed us towards the cases of historical findings from the Jomon period. The first section of the Sanmaru Museum is called the Jomon no Kokoro (heart of the Jomon Period). 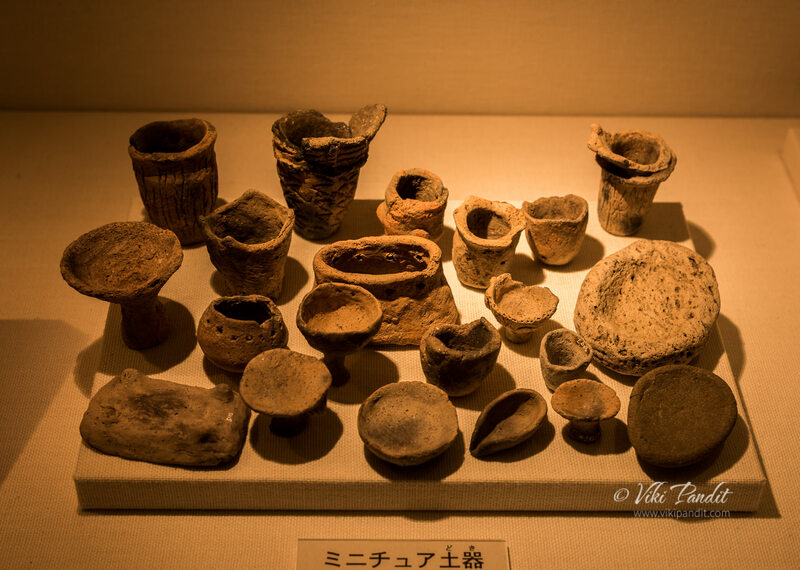 This area displays various excavated items including a large number of pottery, stone artifacts, personal ornaments, clay figures, earthenware, wooden utensils, bone tools and small knitted baskets called “Jomon pochette” from the Jomon period. Shown below is one of the stone tools from the site. 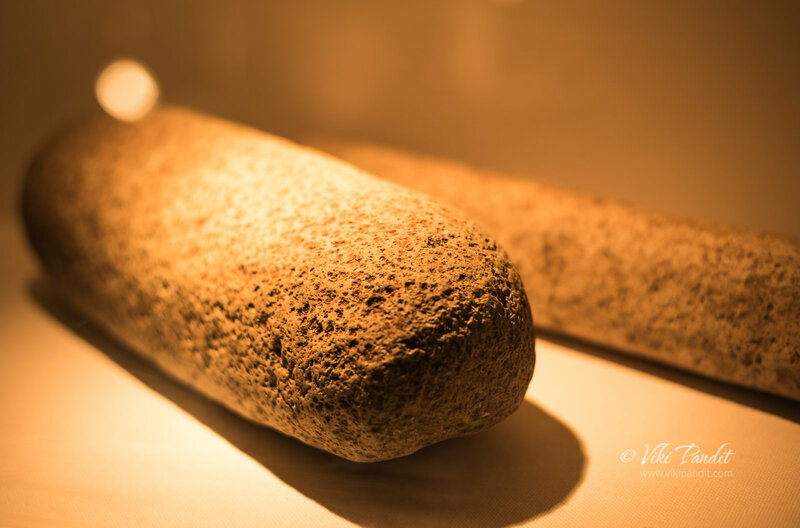 This grinding stone was particularly used as a food processing tool. Nuts, such as chestnuts, walnuts and Japanese horse chestnuts were an important source of food for the people at the time. These were used to crush the hard nuts. 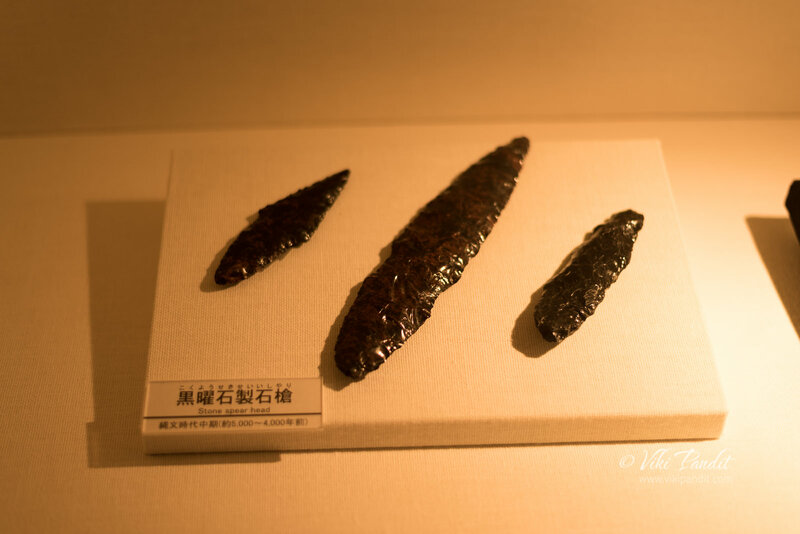 Below you can see some stone spearheads used by the hunters during that period. These hunting tools are characterized by a carefully formed leaf shape and evenly beveled edges that required great skill and patience to create. These tools were created by a process called knapping, where one stone is used to strike another to create a desired shape. 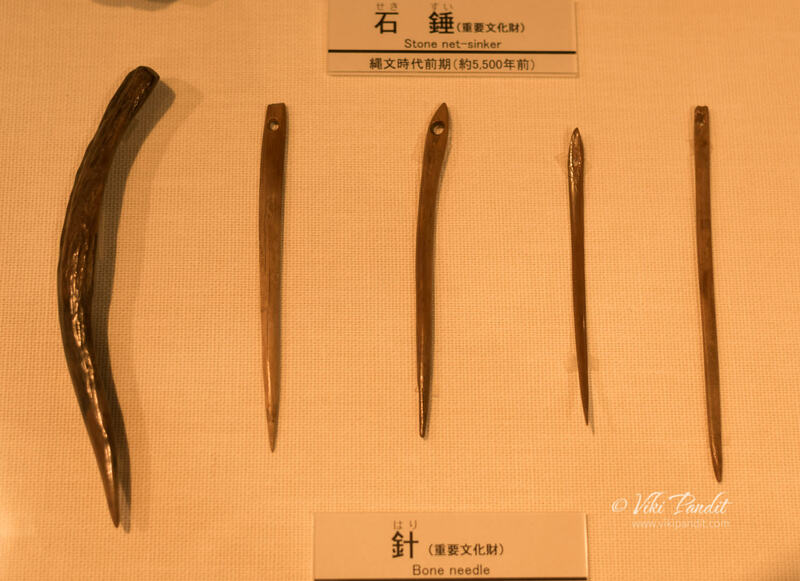 If you are a student of history, you will notice that these stone tools, which were somewhat roughly created in the Paleolithic era, were by the Jomon period meticulously chipped and smoothly polished. 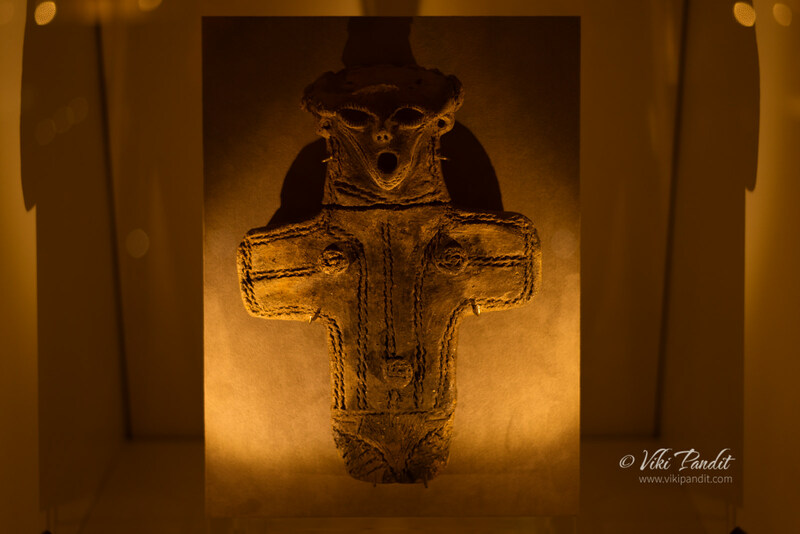 We moved forward to a large board-shaped clay figurine on display. The Sannai Maruyama village site turned up a huge number of human shaped figurines. 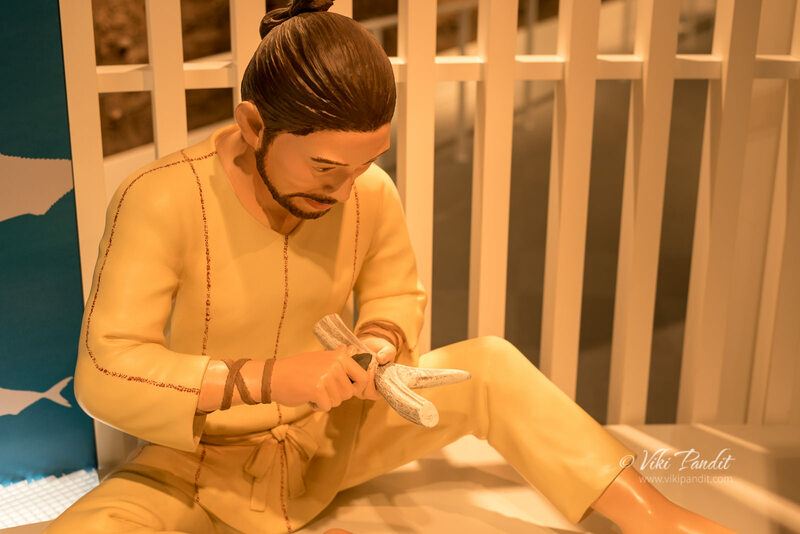 From middle to late Jomon periods, the Jomon people made large numbers of human figures from clay. However these Jomon figurines do not look like real people. They have distorted forms with large faces, small arms and hands. Some of the figurines look like humans wearing goggles. This is not new for many cultures who have depicted humans in exaggerated shapes like the Egyptians, but it does makes one think if the Jomon actually had some kind of extra-terrestrial contact. The pottery vessels crafted in Ancient Japan during the Jōmon period are generally accepted to be the oldest pottery in Japan and among the oldest in the world. The word jômon means “straw-rope pattern,” the typically used description for the style of pottery of the earliest Japanese period. 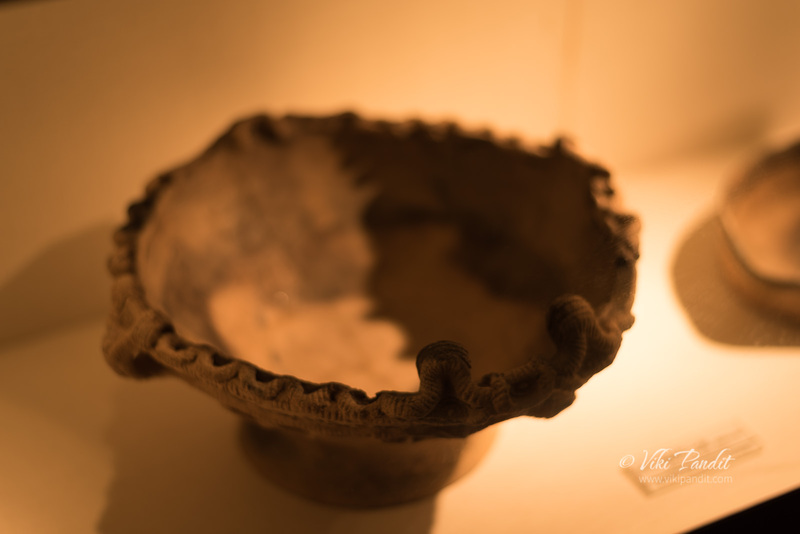 The Jomon Period was named after this style of pottery. All Jomon pots were made by hand, without the aid of a wheel. As in all other Neolithic cultures, generally women created these early potteries. Clay was mixed with a variety of adhesive materials, including mica, lead, fibers, and crushed shells. After the vessel was formed, tools were employed to smooth both the outer and interior surfaces. When completely dry, these were baked in an outdoor bonfire. Pottery found at this site is called Ento(cylindrical) style pottery. A typical Ento style pottery is characterized by an elongated bucket shape with a wide opening and is decorated with cord marks. Below you can see different sized needles created from bones. In those times, animal bones were used to create harpoon heads, fish hooks, needles and even hairpins. Their varying length, thickness and the eye indicate that the Jomon people developed them for specialized purposes. Most of the bone needles shown here are made of mammal ribs. 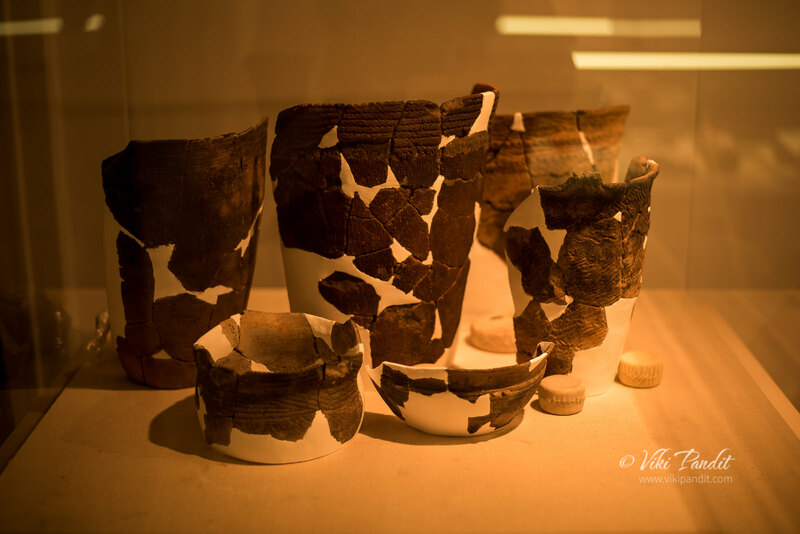 Most artifacts used in daily life such as pottery were made at the site using locally available materials. Ornaments include pendants and earrings made of clay, stone and animal bones. However certain items came from far away. 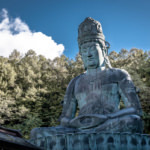 Jade was favored by the Jomon people and specially valued in north Honshu where Sannai Maruyama is located. In addition to complete artifacts such as large beads, raw stones have also been discovered here. If you want a guided explanation while looking at the exhibits, a volunteer from the Sannai-Maruyama volunteers will gladly guide you round the exhibits. As we moved further, we were in the Jomon-jin no Kurashi wo Himotoku (Lifestyle of the Jomon Period people) section. 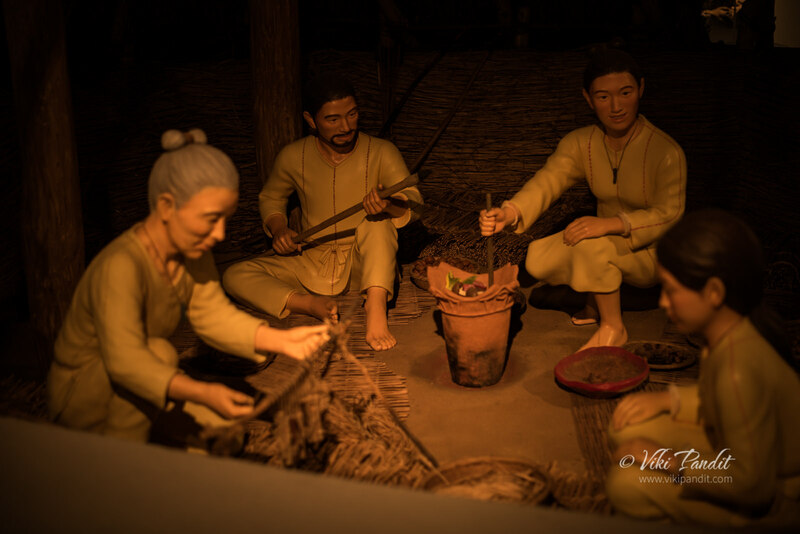 Here life-sized figurines are used to reproduce the Jomon daily life, based on excavated objects. The people in the early Jomon period frequently traveled from one place to the next while engaged in camping and nomadic life. The Jomon people primarily belonged to a hunter-gatherer culture. Over time the sedentary settlements appeared and certain communities engaged in cultivating plants. 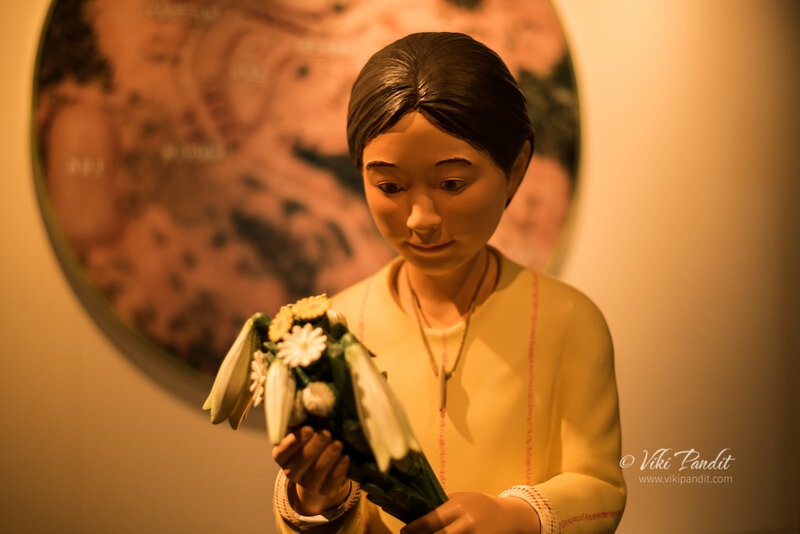 They gradually moved to a semi-sedentary lifestyle and descended from a mixture of the ancient hunter-gatherer Jōmon and the Yayoi rice agriculturalists. Their features can also be seen in the Ainu and Ryukyuan people. In fact the Ainu have often been considered to descend from the Jōmon people, who lived in Japan from the Jōmon period. Below you can see a typical Jomon family gathering. The historical Ainu culture originated in a merger of the Okhotsk culture with the Satsumon, one of the ancient archaeological cultures that are considered to have derived from the Jōmon period cultures of the Japanese Archipelago. The origin myths of Japanese civilization extend back to periods now regarded as part of the Jōmon period, though they show little or no relation to what we know archaeologically of Jōmon culture, one of the reasons why the Japanese deny Ainu as the aborigines. After about an hour of adoring the prehistoric artifacts, we moved on towards the excavation site. 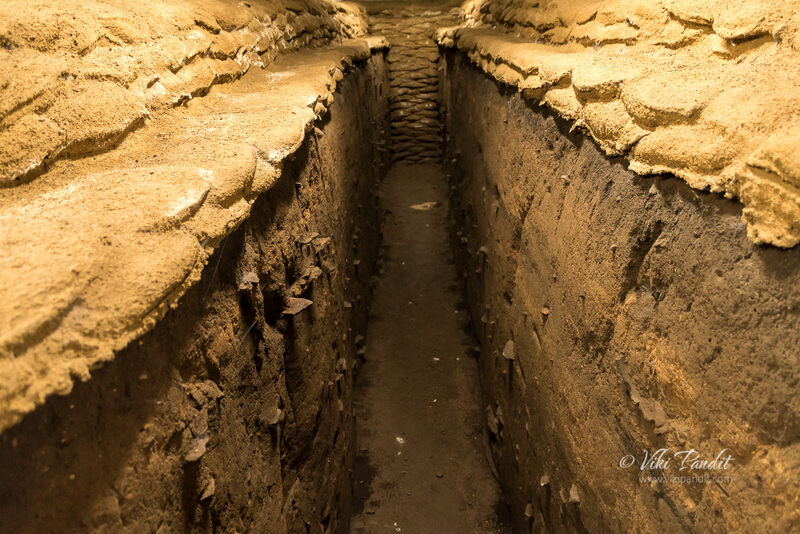 The Jiyu tunnel led us into the the largest ruins of a traditional village, dating from 4,000 to 5,500 years ago. 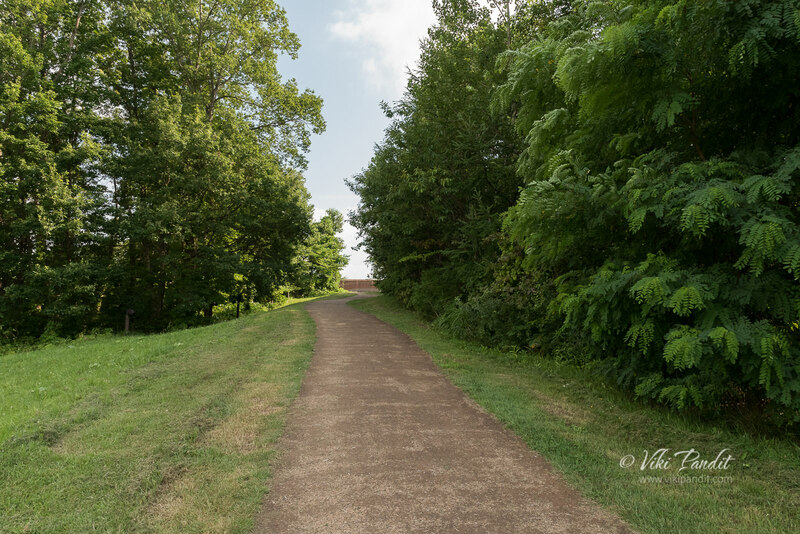 Stepping into this region is like taking a step back in time. The Jomon period experienced a large-scale climate change since it extended for a long period of 10,000 years. The Sannai-Maruyama Ruins are the largest ruins of a Jomon-period (about 10,500-300 BC) village in Japan, and are estimated to date from 4,000 to 5,500 years ago. 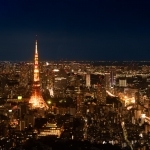 The Japanese archipelago is extremely elongated from north to south and its topography varies considerably; therefore, regional differences in the climate and vegetation were large during the Jomon period as is today. As a result, the cultural style of the Jomon period is not uniform both historically and regionally and it came to take many different forms. There have been previous excavations around the Sannai-Maruyama site between 1953 to 1967. These excavations involved teams from Keio University and the Board of Education of Aomori City. In 1976 and 1987, the Board of Education of Aomori Prefecture and Aomori City also conducted further excavations on the southern part of the site. However, the major breakthrough for the site came in 1992 while excavating during a pre-construction phase for a baseball stadium. This excavation uncovered how large Sannai Maruyama was as well as a large amount of artifacts. A large amount of potsherds and stone implements, clay figurines, jade beads, etc. were disposed together with the soil and formed a mound for over 1000 years. You can see its cross-section here. X-ray analysis shows that the jade excavated at ‘Sannai-Maruyama Site’ in Aomori Prefecture is from Itoigawa; therefore, it is assumed that the Jomon people also traded among themselves over the wide area. These findings demonstrate a change in the structure of the community, architecture, and organizational behaviors of these people. 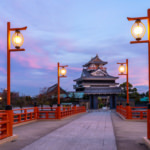 Because of the extensive information and importance, this site was designated as a Special National Historical Site of Japan in 2000. Sannai Maruyama was first settled around 3900 BCE. 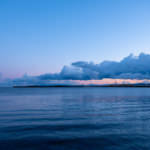 At that time it was inhabited by hunters and gatherers only. Over this period of time, the site changed from a seasonal camp, to the home of a more mobile society, and finally to a settled village. Evidence of this sedentary lifestyle can be found in the the changes in their storage facilities. 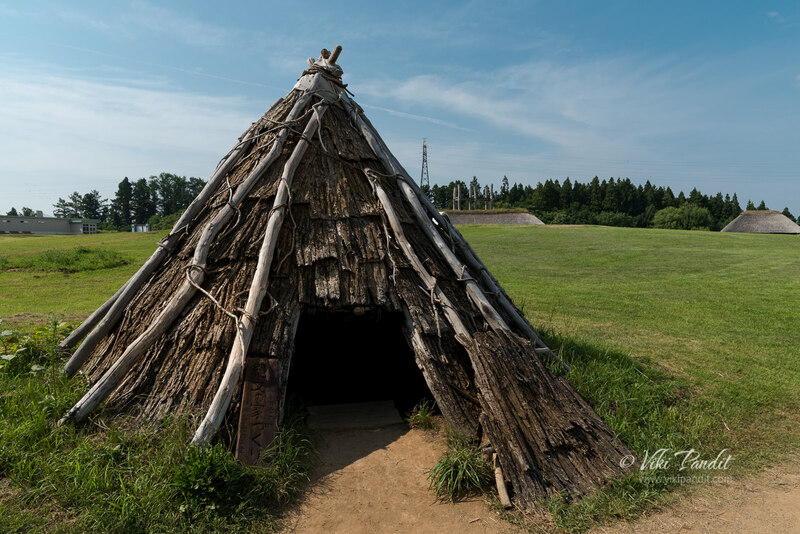 The earliest pit dwellings at Sannai Maruyama were during the Early Jomon period, built between 5900 and 5400 years ago. At that time, Sannai was comparatively small and simple, a collection of pit dwellings. The first settlers on the site lived in pit houses. These dwellings typically were about 10 feet in diameter. The floor was dug below the ground level. A hearth was located in the its center. At least 550 pit-dwellings have been discovered so far and 15 have been reconstructed. Some of the pit houses seen at Sannai Maruyama were simple thatched-roof semi-subterranean houses, like this reconstruction. 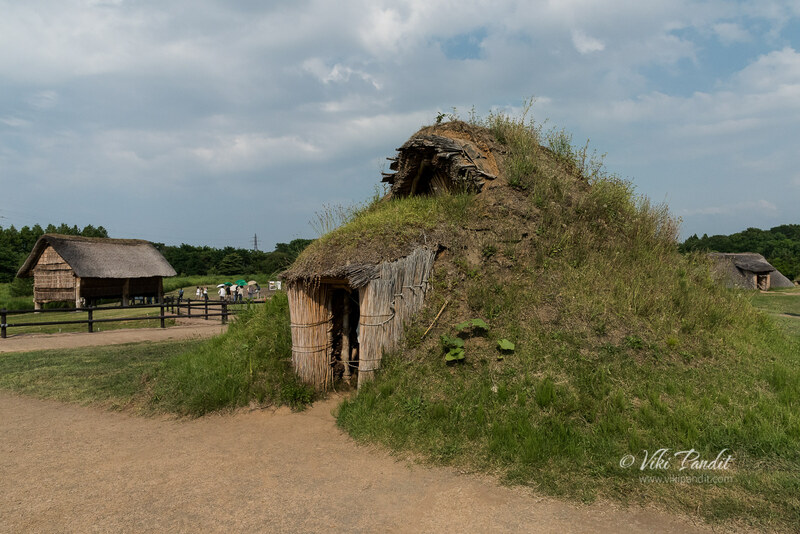 To make this bark-thatched pit dwelling, a pit was excavated into the ground and a bark or wood branches were assembled over the top forming a cone like structure. Over time the thatched pit dwelling was replaced with a sturdier structure as shown below. Like the thatched huts, the floor of a pit dwelling was dug into the ground. Supporting posts were placed at the corners and the walls and roof were built and roofed with thatch. The average size of these pit dwelling is between three and four meters in diameter. Initially they used to store food in underground pits, which allowed them to hide it when they left the site since the occupants were not yet living a sedentary lifestyle. With time, the storage features changed from these underground pits to elevated granaries around 2900 BC. These buildings were built higher than the ground level and were specifically used as storage facilities. As the community became sedentary, long houses began showing up around this time. Long houses were large, oval-shaped structures. The longest one found at the site was 32 meters (105 feet) long. 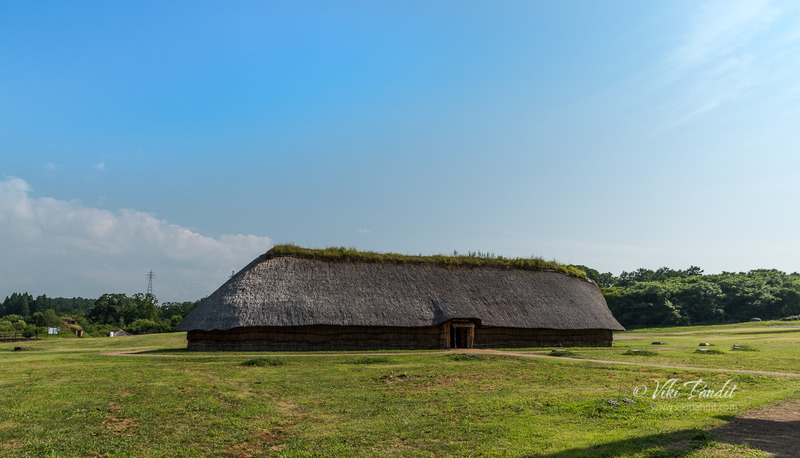 Scholars believe long houses were used for meeting places, workshops, or living space. Pit houses were still being inhabited for individual dwelling at the same time that long houses started to come up on the landscape. 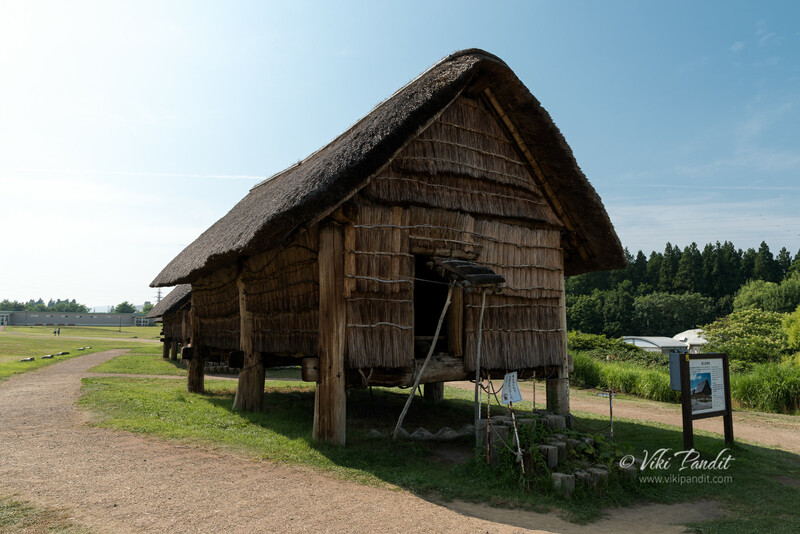 Till now eleven long houses have been excavated at Sannai Maruyama. They were large, oval-shaped semi-subterranean pit dwellings. The reconstruction shown below is the longest, measuring 32 meters in length. This huge structure displays a coordinated labor force that would have required cooperation of several people to make. This displays the gradual shift from an individual to a social community in this time period. 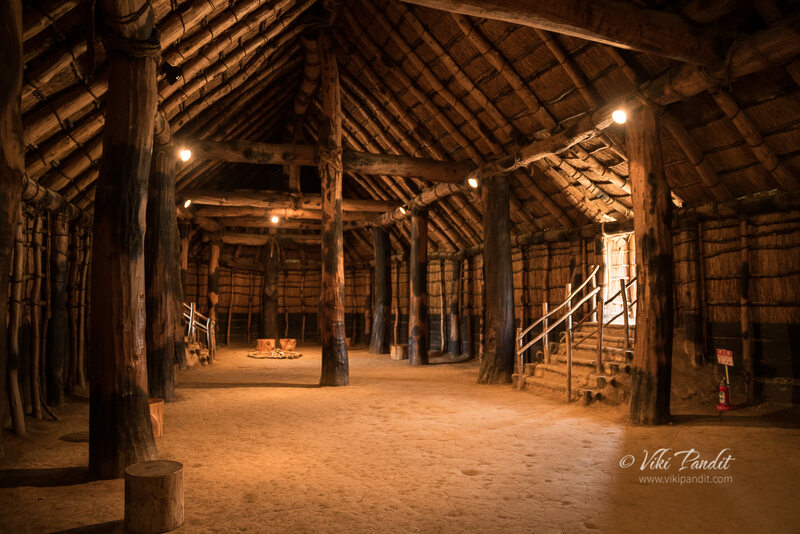 With a stable living style, also, there appeared one of Sannai Maruyama’s most famous structures, the large six-pillared building, was built around 2,600 BC. 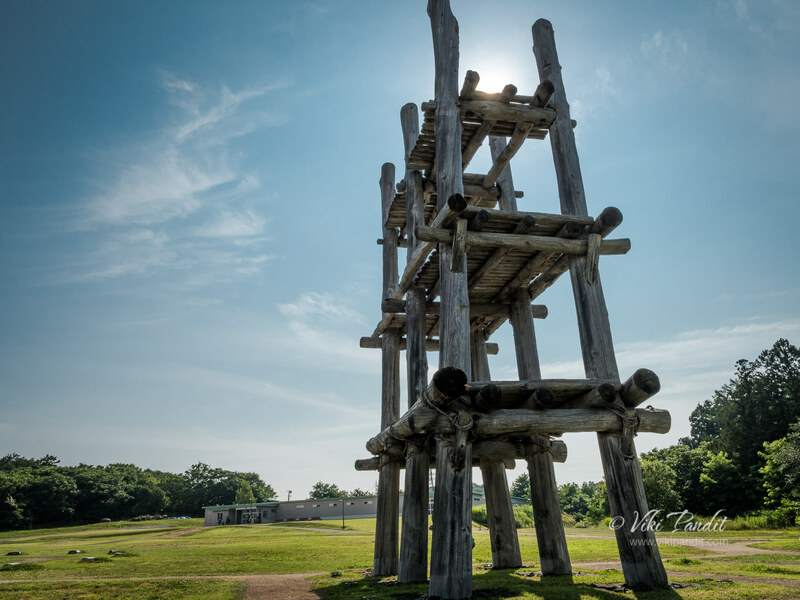 This structure consisted of six large pillars that are believed to have held up platforms. Each one of these pillars was around 1 meter in diameter and was placed exactly 14 ft apart. This large post like platform was certainly used as a watchtower. Burials at Sannai Maruyama took three forms: jar burials, pit burials, and stone circle burials. Large jars have been discovered near the pit dwelling clusters. 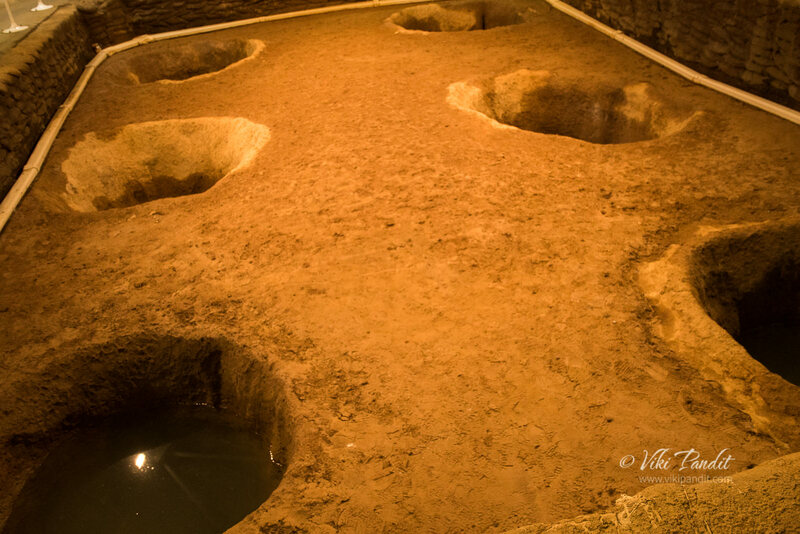 These are assumed to be burials, although human bones have not been preserved within them, on the basis of similar burials found in later Jomon sites such as Yoshinogari. Jar burials have been dated to the Middle Jomon period, from 5400-4300 years ago. The second form of burial was of adults aligned in rows along the sides of long roadways extending from the center of the settlement towards the outside. Finally as shown below, stone circle arrangements have also been found at Sannai Maruyama, which included adult burials. The settlement of Sannai Maruyama ended around 2300 BC. By now we were extremely dehydrated. The harsh sun had taken its toll and we dragged ourselves into the safety of the Jomon Jiyukan. The vending machine for that moment was gold for us, as we gulped on the chilled sugary drinks. The Sannai Maruyama site was designated as a special historical site by the Japanese government in November 2000. Today the public can visit this site and explore its many reconstructions. 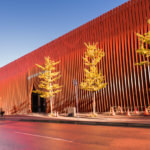 The site also features a Theater, a workshop and a gift shop. If you are in love with history do not miss this site. 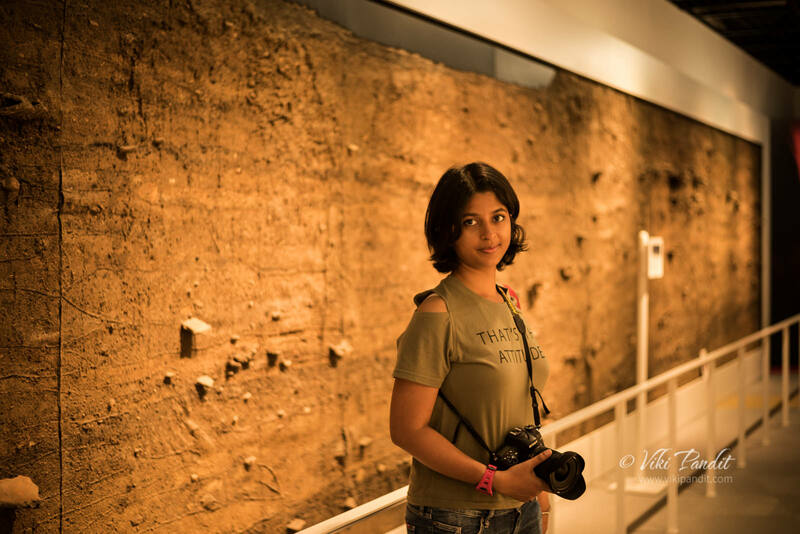 Even though at present, most of the excavated items have been reburied for preservation, the excavation sites and artifacts on display will giving you a feel of life in those ancient times. Thanks for reading. 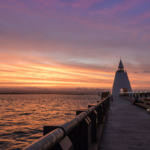 Please leave me a comment if you liked the post or follow my story as we go for a stroll along the Aomori Bay to witness a most alluring sunset.